The brief for this one came from an odd place. But then the best ones often do. We were asked by our clients at Get Living London to come up with an idea for an installation to go outside their offices – they had some over-sized outdoor furniture out there but it had become a little weather-beaten. So we put our thinking caps on and figured that, since Get Living London is about homes and communities, it would be fun to create a community of bird boxes for them. Conceived to sit atop a set of vast poles rising from the concrete forecourt of their offices, we thought it might also be fun to create a vision of the London skyline in each design. Lo, that was exactly what we did. 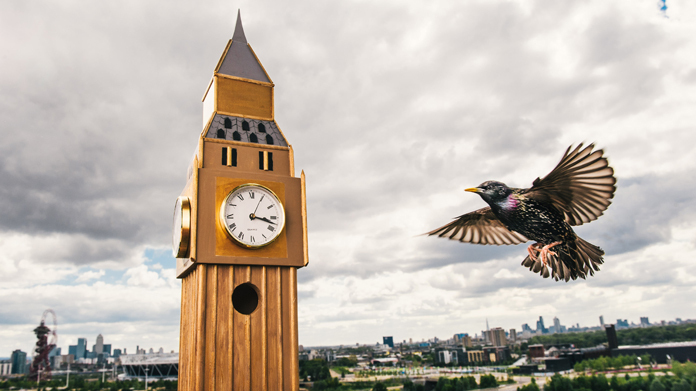 We had an Arcelor Mittal Tower, a Veoldrome, the Gherkin, London Bridge, Tower of London, Big Ben, Canary Wharf and a host of others created in partnership with the RSPB and launched a campaign to bring more native birds back to the City. The announcement of our alternative bird boxes and the launch of our campaign to create a new, avian community in the capital picked up some pretty awesome coverage as a result. There was a half page in METRO and a belting picture story in City AM alongside pieces in all-important local titles such as The Wharf, Newham Recorder and Londonist. Then there was a heap of nature titles including Country File, Birdwatch and even Springwatch, along with some “bloody brilliant” (the team’s words, not mine) coverage on the BBC Radio London breakfast show. A sweet story and some lateral thinking that come good.